To contain irregularities, the Delhi government has decided that people can get their property registered online. It is surprising that while the majority of Delhi areas remain parched due to shortage of water this summer, localities in the prime New Delhi Municipal Council (NDMC) face no such woes. The Delhi Jal Board (DJB) has curtailed water supply to Northern Railway, forcing it to fetch water from Jind in Haryana, according to the Indian Railways. The greenery is the latest victim of water shortage in the national Capital. The parks in most of the areas have gone dry without sufficient supply of water. The scorching heat and delayed monsoon in the city have led the Delhi government to order the extension of summer vacation in all the city schools by one week. The schools will now reopen on July 9. Earlier, the schools, including government, private-run and those under civic bodies, were supposed to reopen tomorrow after the summer vacation for a month and a half. Leader of opposition in the Delhi Legislative Assembly Vijay Kumar Malhotra today asked the Delhi government to immediately rollback the hike in power tariff announced recently or be prepared for a public backlash. With the arrest of a person, the west district police has claimed to have busted a notorious gang of vehicle thieves and solved three cases of two-wheeler theft. The Delhi police has arrested two persons for allegedly being involved in cheating and forgery by impersonating marketing executives. The accused Praveen Kumar and Hukam Chand were arrested on the complaint of Masood Ahmed, a resident of Jama Masjid. Chief Minister Sheila Dikshit sanctioned a grant of Rs 25 lakh to the Guru Granth Sahib Vidya Kendra at Mehrauli. The Vidya Kendra was founded by Sardar Hukam Singh, former Speaker of Lok Sabha and Governor of Tamil Nadu in 1980. This decision has been taken after the government received information about the alleged irregularities in the sub-registrar office. Under the new scheme, people can get their property registered while sitting at home. Initially, the registration system will be made available at the Mehrauli sub-registrar office on Monday and within the next few months, it will be extended to the remaining 12 sub-registrar offices. A government official said that the system will be highly secured. The online system will ensure transparency and eliminate the role of middlemen in the registration process. Under the new system, registration fee will also be online. People will get appointments with senior officials of the sub-registrar office for verification of documents. The sub-registrar office in Mehrauli has been renovated. The remaining 12 sub-registrar offices are also being given a facelift to provide people various facilities like including tea, coffee and snacks. All the sub-registrar offices will have enough computers to help people get any information. The government has set a target of collecting Rs 4,300 crore from stamps and registration fees in 2012-13. The government had increased the registration fee for properties valued above Rs 50 lakh and lifted the upper cap of Rs 50,000 as maximum registration, resulting in increase in the registration fees for high-value properties. Sources said that this is one of the ways that the government has explored to get revenue so that development work can be done in the neglected areas. This after the Delhi Chief Minister Sheila Dikshit promised that VVIPs residing in the Lutyens' Zone areas too would have to take 50 per cut in supply so that there is equitable distribution of water, especially in the areas where people queue up for municipal supply just to fetch a pail of water for daily use. 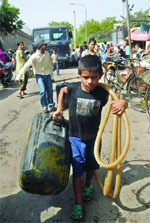 Denizens of northwest and southwest Delhi rely on water reaching them through tankers even as the taps remain dry. Opposition Bharatiya Janata Party legislators from Bijwasan, Palam Vihar and Kirari Sat Prakash Rana, Dharmdev Solanki and Anil Jha respectively have repeatedly underscored this issue by raising it in the Assembly in the recent past. Their prayer to the Chief Minister was to provide water to the people of their constituency in her capacity as the Chairperson of the Delhi Jal Board (DJB). With the blazing summer sun adding to their miseries, the situation spun out of control when people came out to protest demanding that the government provide them with water. Considering the gravity of the situation, Delhi Chief Minister met her Haryana counterpart Bhupinder Singh Hooda, seeking water from his state. When Haryana expressed difficulty in releasing additional water, Sheila Dikshit announced that 50 per cent water to the NDMC areas should be curtailed to fulfill the needs of the neglected areas. Was it a case of grandstanding? So it seems for the diktat from the CM lasted just two days. Normal water supply to the areas serviced by NDMC was restored and confirming this, DJB officials insisted that there is no need for effecting a cut. DJB Chief Executive Officer Debashree Mukherjee told The Tribune that the quantity of the major supply to NDMC is procured from Chandrawal and Wazirabad water treatment plants. A minor portion of the quantity is supplied through Haiderpur water treatment plant. When the raw water supply to Chandrawal and Wazirbad treatment plants fell short, the cut was announced by the Chief Minister, the official said. Now these plants have sufficient water. Hence, the supply to the NDMC areas is restored to normal level of 120 million litre daily (MLD). When the Chief Minister directed that the water supply be curtailed, the DJB slashed it to the NDMC areas by making available only 60 MLD, leading to a crisis in the places which house VVIPs as also some colonies inhabited by the government employees. 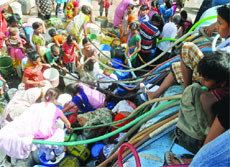 Was the normal water supply restored to the NDMC areas under pressure from the above? Senior officials at the DJB said on the condition of anonymity that the Centre too sought a reversal of the decision on 50 per cent cut even as the majority of Delhiites thirst for water. Divisional railway manager AK Sachan said Northern Railway (NR) in Delhi used to get 30 lakh million litres of water daily from the DJB. But for the past one month, the DJB has cut down the water supply to half, saying that there is a shortage of water and its priority is to provide water to the residents of the city, added Sachan. "Our daily water consumption is 70 lakh million litres (MLD). We used to get 30 lakh litres from the DJB and the remaining quantity of water was managed by the Railways itself. But now, the DJB has curtailed the supply," he said. "We are procuring 5 lakh million litres of water from Jind through tankers. The Railways has a borewell on its campus in Jind. We also have a borewell in Delhi, but that is not enough for the daily need," said Sachan. But still washing of coaches, clothes and other items are not being done in Delhi. We are getting it done outside, the DRM said. However, spokesperson of the DJB denied curtailing water supply to the Northern Railway. "We have not curtailed water supply to the Railways. But it is true that we cannot give priority to it. Our priority is domestic consumers," the spokesperson added. The scarcity of water in the city has affected the maintenance of parks which is done by the municipal corporations. According to officials of the horticulture department, it has been difficult to arrange water for the upkeep of parks for the last one month. They said that most of the tubewells in the parks were not working and so they could not water the plants. "The scarcity of water is already a big problem in the city. We use treated sewage water for watering the plants, but even that is not available for some time now. We dug borewells, but the depleting water table makes them useless," said a senior official of the department. The parks are also shrinking as municipal corporations do not have sufficient gardeners to look after them. The councillors alleged that the civic agencies had been unable to recruit more staff or arrange for better maintenance. They said that they had raised measures to simplify the recruitment procedure of gardeners, but all in vain. The erstwhile Municipal Corporation of Delhi (MCD) looked after the maintenance of 15,000 parks, for which there are only 4,500 gardeners that have now been divided among the three corporations leading to an acute shortage of staff. After trifurcation, over 6,300 parks have fallen in the jurisdiction of the South Delhi Municipal Corporation (SDMC), 6,500 parks in the North Delhi Municipal Corporation (NDMC) and around 2,500 in the East Delhi Municipal Corporation (EDMC). "Around 120 rainwater harvesting plants, of which 90 are in south Delhi, were set up but barring a few, all have collapsed because there is no mechanism to clean the units," said Mahender Nagpal, Leader of the House in the NDMC. The councillors of the SDMC said that cleaning of parks, removal of garbage, painting grills, cutting grass, maintenance of composting sites, etc., will be taken up as priority work. "We have decided to extend the summer vacation by one week and the schools will reopen on July 9 instead of tomorrow," said Arvinder Singh Lovely, Delhi Education Minister. The vacation had started on May 12. Lovely said, "Non-compliance of the order will be viewed seriously." 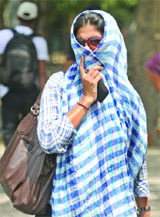 The city has been in the grip of heat wave for the last few weeks with the maximum temperature oscillating between 44 and 42 degree Celsius. "Due to high temperature and extreme hot weather conditions in Delhi, it is hereby ordered that all the government, government-aided and unaided recognised schools under the Directorate of Education will remain closed up to July 8," said Lovely. "All MCD, NDMC and Delhi Cantonment Board schools and aided and unaided recognised schools under these local bodies are also directed to remain closed up to July 8," said the order. Addressing protest meetings at several places in the Capital, Malhotra said the Sheila Dikshit government had abandoned its responsibilities towards the people of Delhi and was blatantly encouraging private power supplying companies to loot and fleece the helpless residents of the city. Malhotra lashed out at the government, accusing it of misleading people on the quantum of power tariff hike. "The hike is not 26 per cent as claimed by Dikshit, but three times more than that. In an ordinary household, the consumption of electricity ranges from 200 to 400 units a month. Earlier, one unit used to cost Rs 3, now it will cost Rs 5.18. "The attitude of the government towards the people is becoming despotic and cruel. The citizens of Delhi are already reeling from unprecedented price rise, corruption, law and order problems and now Chief Minister Sheila Dikshit has dealt another blow to them. She seems to be more interested in pleasing the private power distribution companies by giving them subsidy while imposing taxes on the already overburdened people. Ajay Kumar was arrested in Paschim Vihar. Police officials said he was driving a motorcycle stolen from Sector 5 Gurgaon. Later at his instance, the police recovered two more motorcycles stolen from Paschim Vihar. In view of an increase in the incidents of snatching and vehicle theft in the west district, the police had been holding picket checking at different locations. "While conducting checking at a picket on Balbir Singh Marg in Paschim Vihar around 3 pm, a person on a black Pulsar bike came from the Jwalaheri side. He was stopped and asked to produce the documents of the vehicle. On interrogation, it was learnt that the motorcycle had been stolen," said V Renganathan, additional commissioner of police, west district. In his complaint, Masood said that he has been cheated of Rs 1,43,000 by the accused who came to his house, impersonating agents of Bharti Axa Life Insurance Company, to collect a cheque of Rs 7,300 which was due as the premium of one of his policies. According to the police officials, Praveen Kumar was apprehended from Lalit Park, Laxmi Nagar. On sustained interrogation, the accused disclosed that he along with co-accused Hukam Chand who was earlier working as a tele-marketing executive in Religare Company, planned to cheat people who had accounts with different insurance companies and whose premiums were due. 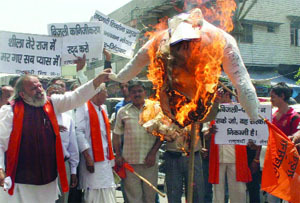 "The accused Hukam Chand had a magic pen whose ink disappears on heating. Since Hukam was earlier working in the Religare Company, he used to receive emails from the system of the company, through which he received the details of the clients whose premiums were due," said Chhaya Sharma, DCP South. The accused Humam Chand told Praveen that he has taken a cheque of Rs 7,324 from a client of Bharti Axa Company, namely Masood Ahmed. Later, both of them erased the date, name and amount on the cheque by using a magic pen. Hukam then wrote the name Anil Dhama and filled in the date and amount Rs 1,43,000 in the cheque and withdrew the said amount. The police claimed to have recovered from their possession Rs 95,000, two bank cash deposit slips, the magic pen and the cloth iron used in the crime. The Kendra was opened to provide free Gurmat education and also specialised courses like automobile, paramedical training etc. to the poor Sikh boys and girls.